I have a confession to make: I have never been to a Greek restaurant. I haven't tried a lot of traditional Greek dishes, so I can't tell you how much these potatoes taste like the ones you'd get in a Greek restaurant. What I can tell you, however, is that they are really good. Joe didn't really like them, but that's because he's not a huge fan of lemon, and these potatoes are very lemony. I knew when I started making them that he probably wouldn't like them, but you know what? Sometimes I have to make something just for me. Some of the commenters on Allrecipes said the potatoes were bland, so I did a couple of things to combat that: I added lots of salt and pepper, and I used fresh herbs. If you don't like the flavor of lemon all that much, definitely cut back on the amount of lemon juice you use. Or, you know what? If you don't like the flavor of lemon, just skip these and make something else. 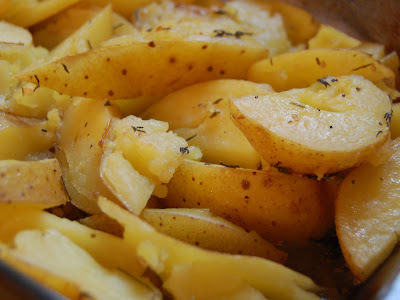 Since rosemary and thyme both have lemony overtones, the dominant flavor in these potatoes is definitely lemon. I liked them a lot and had two helpings. Andrew ate his fair share, too, so I guess he's following in my footsteps instead of his father's and is embracing citrus for all it's worth. Good boy. 2. In a small bowl, mix olive oil, chicken stock, garlic, lemon juice, thyme, rosemary, and salt and pepper. 3. Arrange potatoes evenly in the bottom of a medium baking dish. Pour the olive oil mixture over the potatoes. Cover and bake 1 1/2 hours in the preheated oven, turning occasionally. Uncover and cook for another half hour, until potatoes are tender but firm.